High-quality, durable and reliable file storage is important. Your business documents, tax papers, client records, company invoices, and many other files must be kept securely and safely. Not only might you need to use or reference these documents later on, but you may be required to retain them for several years for tax purposes. That’s why we sell file storage boxes in a number of different sizes and types. We want to have a selection as diverse as you are. Our file boxes are strong enough to withstand daily wear and tear, stackable so they don’t take up too much space, and durable so they won’t fall apart over time. Your critical documents are too important to trust to random boxes that you’ve managed to acquire from various sources. Instead of stuffing your key paperwork into reused boxes, keep your files safe and secure in uniform storage boxes that not only keep your documents secure, but that make storage easier and less of a hassle. You shouldn’t spend time worrying about whether or not your important paperwork is safe. Choose our boxes and eliminate these worries from your head so you can focus on more important matters. We have years of experience in packaging and always work to deliver the high-quality products that our clients need. You can trust our team to deliver reliable and durable boxes, whatever your needs may be. We not only sell strong and reliable products, but we also deliver superior customer service. We know how important it is to work with a business that you trust and one that respects you. 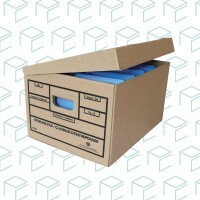 We offer an extensive variety of file storage boxes to meet your needs, whatever they are. Whether you are looking for economy file boxes with pre-printed panels on the side for easy labelling, strong bankers boxes with top flaps, file storage drawers with steel support frames, or any other type of document box, we can help.